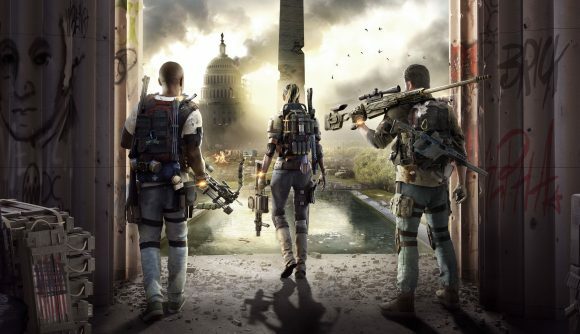 The Division 2’s raids will be “much, much bigger” than its missions, but will also introduce new mechanics that won’t really filter into the main game. In an interview with creative director Julian Gerighty, he told PCGamesN more about the endgame content of the upcoming post-apocalyptic title. The Division 2 raids were announced along with the game at last year’s E3, but their sheer scale definitely wasn’t advertised back then. Jordan says he played missions last week that took up to an hour to complete, so for raids to be “much, much bigger” suggests a pretty significant time commitment. But as well as time, you’ll have brand-new mechanics to contend with as well. The first raid, which is set to release “very soon after launch” has been put together by a team with some puzzle experience. The Division’s final end-game Incursion, The Stolen Signal, introduced some similar mechanics, and was put together by the same team that’s making the raid in Division 2. The Division 2 release date is March 15, so it’s about six weeks until we head to Washington D.C. Of course, to do so on PC, you’ll need to use the Epic Games store, as The Division 2 won’t be coming to Steam at launch. That got Ubisoft in some hot water with fans, but not as much as when it was forced to apologise for making light of the recent US government shutdown. It’s been a bit of a bumpy few weeks for the team, but hopefully the raid will be a bit easier to navigate.